I think it might be time I change my perspective on something. I have never affiliated myself directly with a political party – I’ve always been an independent. I’ve voted for many Democrats, especially at the national level, but I’ve cast votes for many Republicans, as well, often at the state and local levels*. I’ll always vote for the best person (ideally the best woman) for the job, but I think it’s time I sacrifice a little bit of my fiercely independent nature and pull in closer to the Sisterhood. Yesterday, I had the opportunity to go to the first Women’s Health & Economic Summit, hosted by the Michigan Women’s Progressive Caucus, and particularly Democratic women from the State House. I had been quietly getting to know progressive women here in West Michigan, over the past year, in part because I see very clearly the war on women, on black and Hispanic people, on the LGBT community, and, all too often, on common sense. I do not wish to roll the clock back even farther, and I am keenly aware of the risk the next few cycles of elections holds for all of us. I walked in on the event, yesterday, with some concern, which was not entirely unfounded. I am a businesswoman who has a very strong sense of entrepreneur identity. I work at a mid-size non-profit (Hope Network, which has a financial size of more than $100M in revenues), and I innovate there. We’re doing things now that have never been done at Hope before, and we already have in our cache the next, next, and next levels of what we’re trying to do (and are prepping the old guard to be very, very afraid). Some people also call those of us who are entrepreneurs “in the big box” intrepreneurs, and I do like that, too, although my businesswoman identity is tied into pro-social innovation, not the big box, so social entrepreneur is probably what I like best. Anyways, as I walked in the door worried that I would not be welcome as a businesswoman, even though we know how many progressive women are small business owners. Rep. Winnie Brinks (D-Grand Rapids), a hometown sister, delivering her statements early in the day. I was a little right. In the Q&A following a morning panel, two people used their opportunity to ask questions to attack entrepreneurs and providers and everyone else who serves in the healthcare industry. While there is some validity to their point, I felt personally attacked by this, because it’s what I do, and although there is a great need for structural reform (for which I myself advocate, in fact, I advocate unhesitatingly for a transition to a single payer system, to, in essence, doing what works in many other parts of the world, rather than practicing American Exceptionalism), I do not believe in an attacking dialog on this, and especially not one in which there is no room even for healthcare providers to have voices. Intersectionalism runs deep – this is not a claim to my identity, just a statement of fact. It’s the whole point of intersectionalism. I cannot put away the fact of my Indianness. I cannot ignore the fact that, during my lifetime, although Mr. Obama is a noteworthy exception, every time there has been a Democrat in the White House, relationships with India have become jingoistic on the American side, leading to cooling of bilateral cooperation and adversely affecting the lives and livelihoods of my family. I have, nonetheless, supported all the Democrats who tried to get there, during my adult life, starting with hand-delivering get-out-the-vote information for Bill Clinton when I was a senior in high school. In this same sort of way, and perhaps more saliently to me, because my identity as a businesswoman is probably stronger than my identity as an Indian (for better and worse), I can’t put away my belief in economic empowerment through business development when I enter progressive spaces. I want to back up a step, though. Before that happened, when I walked in the door, people immediately recognized and welcomed me (and I wasn’t really sure there would even be many people I knew). I didn’t have to give my name. My friend, Amber, at the check-in station, already knew it. Representatives and activists came and made me feel welcome. Right away. This is pretty much what happens, time and time again, when I enter the spaces of my feminist sisters. It is frequently not what happens when I enter LGBT spaces**. And it’s something I’ve been listening to, thinking more and more about how I need to embrace my feminist roots, and my feeling that there is some structural mis-alignment (as exemplified by my giving) that over-represents my LGBT identity and underrepresents my feminist identity, when the latter is one I have been clear is much stronger for me. That is, my strongest identity of all is that of being a woman, of being a Sister. So I did not walk in the door feeling unwelcomed – I walked in the door feeling very welcomed, at home, where I belong. This is a thing I’ll come back to, please bear with me. If the moment I described above validated my fears, they were subsequently invalidated by the rest of the day. I attended two great panels that were about empowering women economically. The morning session I attended was music to my ears, talking about the value women bring to workforce development, and the many shared goals women of all ages and millennials bring to the workplace. The things with which we will change the world. We talked about fighting sexism, recognizing implicit biases in the workplace that harm women (and minorities), and building a workspace that meets the changing needs of the workforce as women and millennials come to dominate. One of my goals is to integrate my life even more – I want to live my career, whether my current role as Director of my Center for Autism, or future ones, in a deeply feminist way. So we’ve been tackling a lot of these issues at the Center. And it’s tricky. I find my millennial leadership team members, amazingly, afraid to ask me if they can bring their young children into work due to a sudden issue with childcare. At my Center where we grow the lives and dreams of young children. In part, they’re scared because, technically, this is against our corporate policy. I respond (and HR may deal with me as they wish) by reminding my leadership team, gently, that they set an example of how to work with the families we serve, who are dealing with the same exact problems, and that of course they should bring their children in, and of course I trust their judgment in the matter. They do not need to say that dedication to their jobs will not be adversely impacted by their children paying occasional visits to my Center. I knew that already. Time to admit I have some work to do. The rest of the day was much like that. 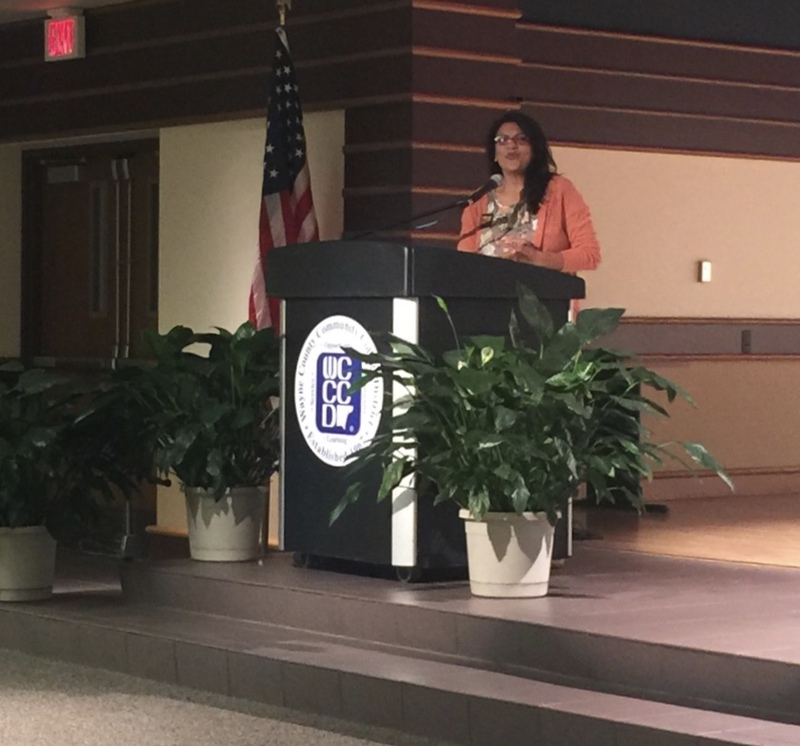 Rashida Tlaib, alongside whom I spoke last year at Lady Parts‘ V to Shining V, received an award at lunch and delivered an impassioned and remarkably funny speech. Particularly impactful to me was her story of breastfeeding at the State Legislature and something atrocious a man had said to her, emphasizing that no matter how high we climb, we are still sexualized and objectified and well, treated like women. It mirrored something in passing that another Representative had said, which emphasized how women who are running the State still find themselves running home to cook meals for their families, much like I do. Rashida Tlaib of Sugar Law Center being fierce. It’s kind of what she does. One more thing that resonated with me is how many of the women in the House spoke about how influential women in their communities had told them to run for office time and time gain – sometimes more than ten different women had told them this – before they listened. This has actually happened to me more than a few times in the last year, and at least two women I respect immensely have told me to do it. I need to think much more carefully about this, as I learn about what it is that I don’t know (which is kind of a lot) about the business of running for office. I think I worry, too, that I may not be electable, and that if I ran, I would be taking up attention that another politician deserves – taking up too much space. I don’t know if the former is really founded, because I have so many people in my life who are willing to support me. And I got a good dose of reminder that the latter is how entirely too many of us women think, entirely too often. This is where I want to leave this story. I think it’s time that I think much more critically about my sense of need for independence, and the extent to which that’s a show, pretend, vs. my really deep-seated sense of Sisterhood, loyalty, and alliance. I need to question the implicit assumptions I have that Progressives and Democrats are anti-business. I need to listen to my heart, that tells me when I’m among progressive women, I belong more than I have ever belonged. I need to listen to my brain, which tells me that women are in a perilous time right now, and solidarity is more important than ever. And I need to listen to my voice, which tells me, sister, you’re stronger than you think you are, and you have more to say than you give yourself credit for. And I will listen. To all three. * I do own my regret that some of the Republicans for whom I voted did what I wanted as a businesswoman but turned around and sided away from business interests, with social conservatives, when politically convenient, to the detriment both of women and of the LGBT community. While I’m a dimensional, non-single-voter issue, this is a compromise I recognize that I made, in the past, without full appreciation of the consequences, and I am trying to learn better. ** Although even in that story, Christina Karhl and her wife waylaid us for a drink and were one of the shining spots in that awful night.